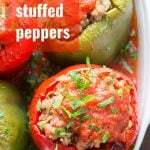 Stuffed peppers were a regular when I was growing up. They were usually filled with ground meat and rice, and served with tomato sauce — I’m guessing a lot of you guys ate pretty much the same thing when you were kids. Anyway, one thing I noticed recently is that there are lots of vegan stuffed pepper recipes out there on the interwebs, but most have a twist. There are lots of recipes Tex-Mex stuffed peppers and stuff like that. 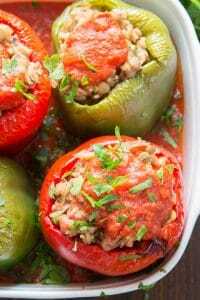 Even on this site, I’ve got falafel stuffed peppers, risotto stuffed peppers, and burger stuffed peppers, but nothing like the classic stuffed peppers that mom used to make. I decided it was time for a good old classic Italian stuffed pepper, recipe, vegan style. The rice cooks up in another pot. Start by sautéing some onion and garlic in olive oil. Next, add some broth, your rice, and Italian herbs. Bring the liquid to a boil, turn down the heat, cover the pot and let it do its thing. Don’t peek! You want to contain all that heat and steam in the pot to get your rice just perfect. When the rice is done cooking, stir in some tomatoes and your lentils. 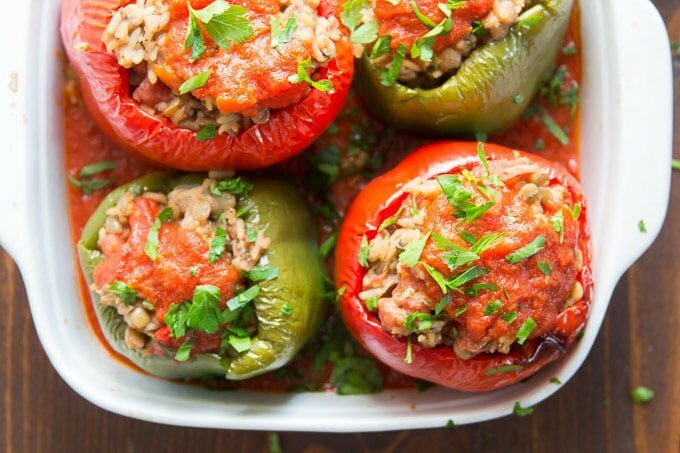 Your vegan stuffed pepper filling is ready! While the rice and lentils cook, start roasting your peppers. Cut the top off of each pepper, scoop out the insides, and rub it with olive oil. Stick your peppers in a pan and pop them in the oven to start cooking. Top your peppers with some fresh herbs, and dig in! Make ahead option: make the filling a day or two in advance and store it in a sealed container in the refrigerator. You may need to give the stuffed peppers a few extra minutes of cook time in order to heat the filling up during baking. If you’re using homemade marinara sauce, you can make that a day or two ahead as well. Be sure to read this entire recipe before you begin cooking. You’ll have a few things going on at once, and reading the recipe in advance will help you to plan and make the most efficient use of your time. My lentils have been cooking forever and they’re hard as rocks. What gives? Usually that means your lentils are old. Throw them out and get some new ones. You might also experience issues if you’re boiling them in very hard water. If you think that’s the case, try using filtered water instead. Can I substitute a different variety of lentils? You can! Green lentils would work great, though they will take a bit longer to cook. Red lentils fall apart and get super mushy when you cook them, so your filling will have a totally different texture, but I think it would still be good! Can I substitute a different variety of rice? Yup! You may need to adjust the amount of broth used and cook time. Refer to the package instructions on your rice. 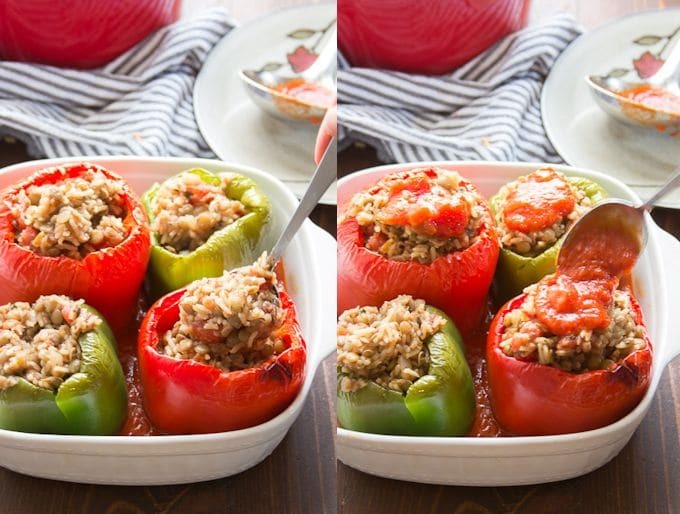 A note on serving size: this recipe makes 8 servings, but just 4 stuffed peppers. I initially intended it to be a 4 serving recipe (1 pepper per serving), but a half of a pepper plus salad left both my husband and I pretty full. If you’ve got a big appetite and/or aren’t making any side dishes, this might be a 4 serving recipe for you. 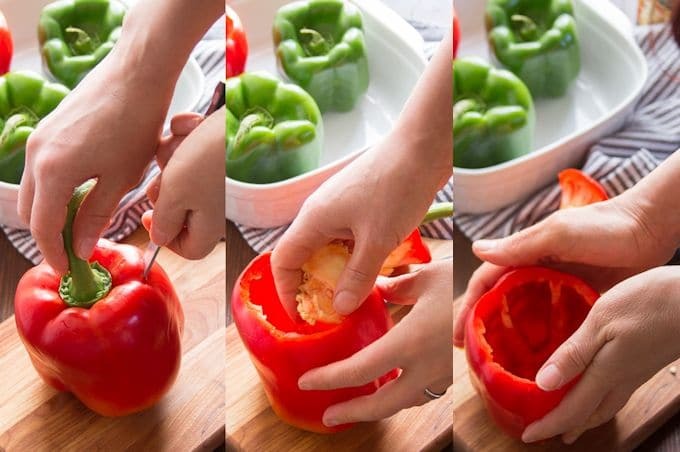 You may also be able to use smaller peppers and get 6 servings (1 pepper each). Stuffed peppers like mom used to make, but these are vegan! 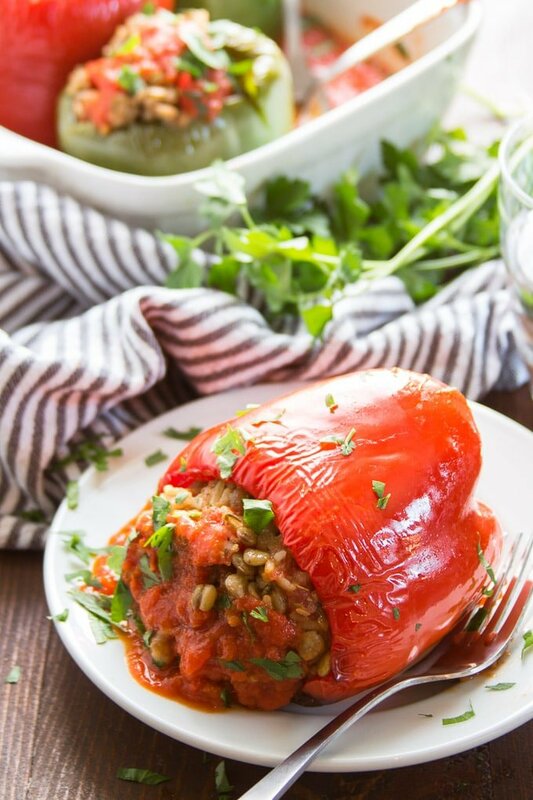 These roasted bell peppers are filled with an Italian-spiced mix of lentils and rice, and topped with zesty marinara sauce. The perfect meal when you're looking for some healthy comfort food! Begin by making the filling. Coat the bottom of a medium pot with olive oil and place it over medium heat. When the oil is hot, add the onion and cook, stirring frequently, for about 5 minutes, until soft and translucent. Stir in the broth, rice, Worcestershire sauce, basil, thyme, fennel, and red pepper flakes. Raise the heat and bring the liquid to a boil. Lower the heat until the liquid is just simmering. Cover the pot and allow the rice to simmer for about 40 minutes, until the rice is tender and the liquid is absorbed. While the rice cooks, place the lentils in a small saucepan and cover them with a few inches of water. Lower the heat and allow the water to boil until the lentils are tender, about 20 minutes. You can add more water during cooking if too much of it dries up. While the rice and lentils simmer, begin preparing the peppers. Preheat the oven to 400°F. Cut the top off of each pepper, removing the stem, then use your hands to scoop out the seeds and core. Rub the outside of each pepper with olive oil, then place the peppers, cut side up, in a 9 x 9 inch baking dish. Place the dish into the oven and bake the peppers until the skin just starts to blister, about 25 minutes. 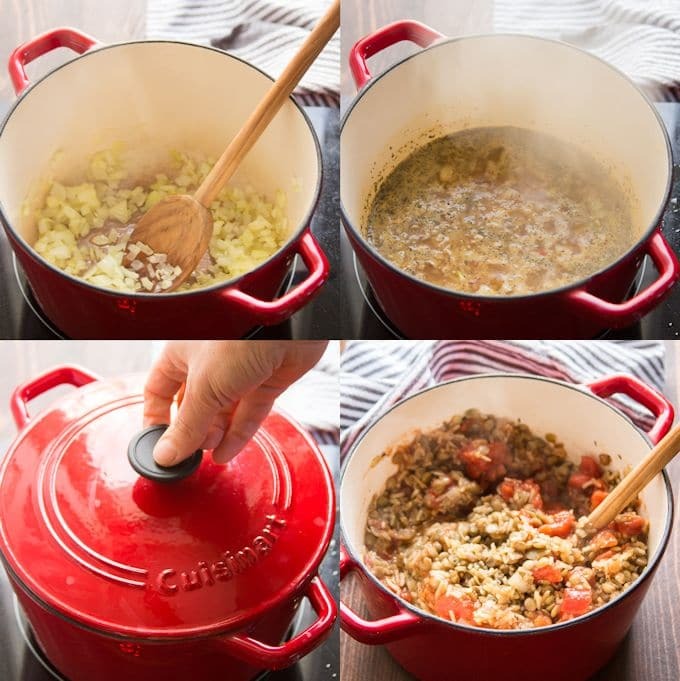 When the lentils are done cooking, drain them in a colander and return them to the pot. When the rice has finished cooking, allow the pot to sit with the lid on for 5 minutes. Remove the lid from the rice and stir in the lentils and tomatoes. Season the mixture with salt and pepper to taste. When the peppers have finished baking, remove the dish from the oven, but leave the oven on. Spoon 2 cups of marinara sauce into the bottom of the pan, surrounding the peppers. Spoon the filling into the peppers, mounding some on top if necessary. Top each pepper with a spoonful of sauce. Return the dish to the oven and bake the peppers for about 10 minutes more, until the sauce and fillings are hot. Sprinkle with fresh basil or parsley, and divide the peppers onto plates. Serve. If you're substituting canned or precooked lentils, you'll need 2 cups. You used to have a link where we could save your wonderful recipes to Pinterest…but I do not see that anymore?? Hi Molly! 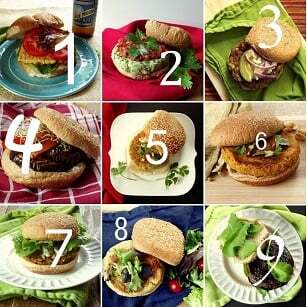 Are you looking for the buttons below the recipe? If so, sorry! I was making some changes and accidentally removed them. I’ve added them back now -right below the nutrition info! If you’re on desktop you can also hover your mouse over an image and a pin-it button will pop up. I hope that helps, and let me know if you have any more trouble.